A simple two drawer nightstand, this piece offers great bedside storage space. The top drawer has a split front look and is adorned with round metal knobs. 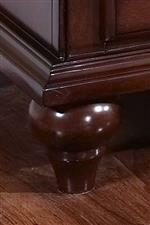 Turned feet support this nightstand which has plenty of surface space to hold up a lamp. The Spring Creek Two Drawer Nightstand with Turned Feet by New Classic at Casa Leaders Inc. in the Wilmington, Long Beach, Torrance, Lakewood, Los Angeles area. Product availability may vary. Contact us for the most current availability on this product. Transform your sleeping space with the Spring Creek collection. With numerous storage options available, including footboard storage in each bed, you won't have any problems keeping your bedroom organized. Moulded features, turned feet, and rounded hardware offers traditional style to each piece. Low profile beds with sleigh style headboards will leave your bedroom feeling more open, while the tobacco wood finish offers a rich look. Add the Spring Creek collection to your home for a distinctive change in the place you spend most of your time. The Spring Creek collection is a great option if you are looking for Traditional furniture in the Wilmington, Long Beach, Torrance, Lakewood, Los Angeles area. Browse other items in the Spring Creek collection from Casa Leaders Inc. in the Wilmington, Long Beach, Torrance, Lakewood, Los Angeles area.